JoElle considers herself fortunate to have grown up in a basketball family. Her dad,Elton Byre,was a basketball player/coach,and her mom,Jolene Byre, was assistant coach for the YMCA team that gave JoElle her basketball start in the 4th grade. JoElle played for Washington High School as a junior and senior in Sioux Falls. JoElle never lost a game in her high school career.JoElle would score 865 points in those two years, she would help lead the Warriors to a 46-0 record and back to back State A Championships in 1980-1981. She was named to the All-Tournament Team and was a first team All-Stater in those years.She still holds the record for most points scored in championship play,with 81 points, and was chosen Miss Basketball, South Dakota 1981. She was also a standout in track and high school volleyball. She received a full ride to play basketball at SDSU.She was later named to the NCAA All Academic Basketball Team. She would continue her graduation as a graduate assistant at Winona State University, were she coached basketball and traveled overseas with Christian Outreach International, playing basketball in Europe as well. She taught and coached girls basketball at West Central and Sioux Falls Washington before becoming a stay home mom in Sioux Falls. Mr. & Mrs. Chuck Benson have four children,Austin,Ellie,Cole,and Seth. Its no sup rise the children show a keen interest in basketball. 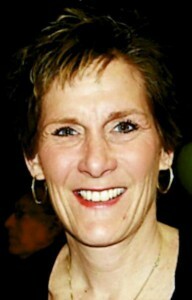 We are so happy to announce that some 30 years after high school graduation, that JoElle Byre Benson will be inducted into the South Dakota High School Basketball Hall of Fame at the Dakota Prairie Playhouse on the DSU Campus at Madison,South Dakota. Congratulations, JoElle and to all of you that helped her reach this pinnacle.